Cancun is a vacationer’s paradise. You can soak up the sun, enjoy time away from the stressors of life and have some fun. One of the things that people love to do on trips to Cancun is snorkel. And with very good reason. The Mexican Caribbean waters around Cancun are home to the second largest coral reef in the world. 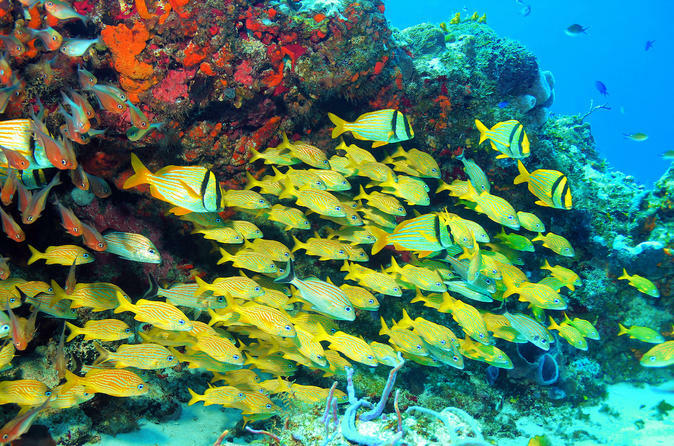 In and around this coral reef you can find colorful tropical fish and marine life of all types. You can even snorkel one of the world’s most famous marine national parks. If you travel to Cancun you aren’t going to want to stay in your plush resort and watch television. Get out and see what Mexico and the Caribbean has in store for you! The sun and warm waters beckon and these 5 snorkeling tours are just what everyone needs when vacationing in Cancun. Many of these Cancun snorkeling tours are even family friendly so choose the one that fits your family’s tastes or take a family vote and splash into those warm waters of the Caribbean. First let’s look at my favorite snorkel tours with full reviews and our guide to the best snorkeling in Cancun below. There’s nothing quite like exploring a shipwreck underwater while snorkeling. With the Reef & Shipwreck Snorkeling Tour in Cancun, you can do just that. Your tour lasts 3.5 hours and can leave at three different times throughout the day depending on your preferences. You will stop at three locations while on your tour including: a conserved coral reef where you can see plenty of marine life; a sea grass bed where you can see stingrays, turtles, crabs and lobsters; and, the final stop is a shipwreck sitting atop a bed of white sand with schools of colorful fish swimming about. Before you head out on your half-day Cancun snorkeling tour, you will be fitted with your gear, including: your snorkel and mask, your life vest, your fins, and, if you’d like, a thin wetsuit. There is an optional lesson for those who may not have all the skills required for such a long snorkeling trek before you head off in the boat. 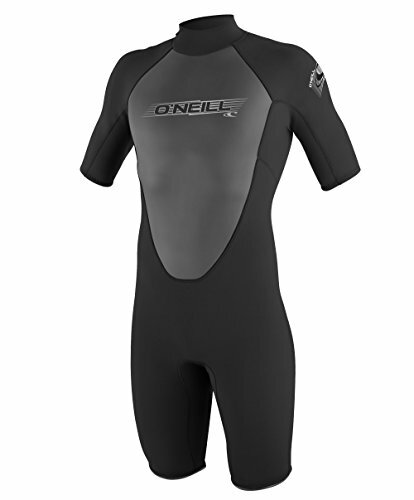 This lesson is conducted in the shallows just off-shore so you can become acquainted with the water and your gear. After your snorkeling tour, you can enjoy a cold bottle of water and dry off with provided towels on board the boat. Share your pictures with others in the group as you head back to your hotel. This snorkeling tour is perfect for families and snorkelers of all skill levels. All of the equipment you need is included in the package. You will even be picked up and dropped off from your hotel lobby – be sure to let the reservationist know which hotel you’d like to be picked up at and dropped off from when you call to schedule your tour. Also specify whether you would like the 9am, the noon, or the 2:30pm tour. The package is only designated for small groups of up to 10 participants so you will get personalized service from your guide. The Reef & Shipwreck Snorkeling Tour is not to be missed if you are looking for the adventure of a lifetime with your family in Cancun. When you book your Tulum snorkeling tour, you want to specify whether you want to leave from Cancun or from Playa del Carmen. 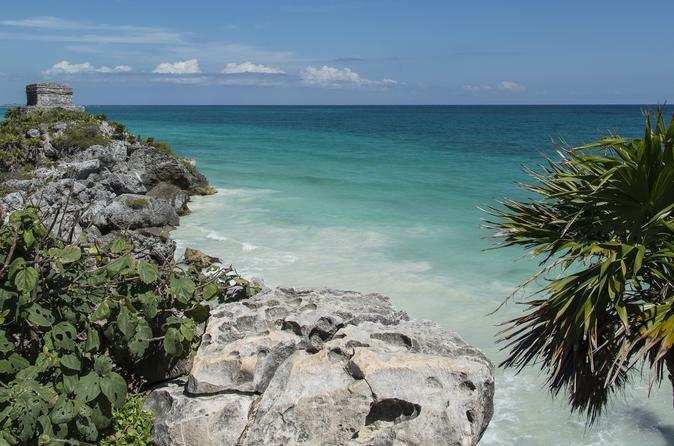 Either way, visiting the Tulum area, with its stunning Mayan historical ruins is something not to be missed. Mayan history is full of legend and myth. 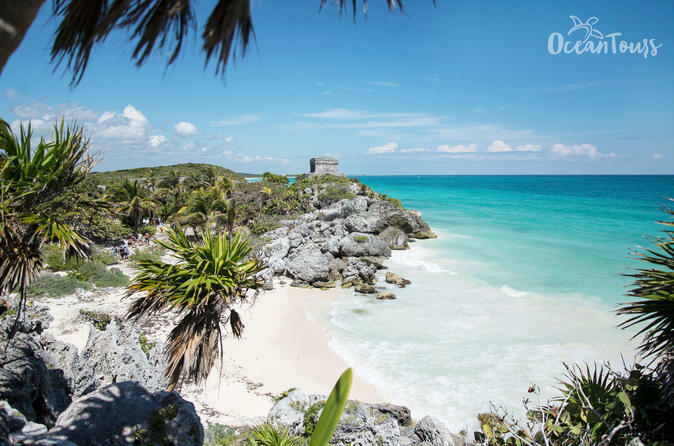 You will be able to visit the archeological site in Tulum as well as snorkel the crystal clear, turquoise blue waters of the Mexican Caribbean. While snorkeling these beautiful waters, you will see spectacular coral reefs, brightly colored fish, turtles, stingrays, and even rock formations that you won’t be able to see anywhere else. You will get to these snorkeling spots from local motorboats manned by local guides who will take you on your underwater adventures. The Tulum snorkeling tour package includes the half-day tour of the Tulum archeological site as well as the snorkeling tour of the Mexican Caribbean, transportation to all sites, entrance fees to all sites, snacks and beverages while on your tour, all snorkel gear that you need, and the guides you need. You will have the chance to purchase a USB stick with digital photos from your trip. This is a great snorkeling tour for families as the Tulum guided trip as well as the snorkeling tour are perfect for all ages and skills. 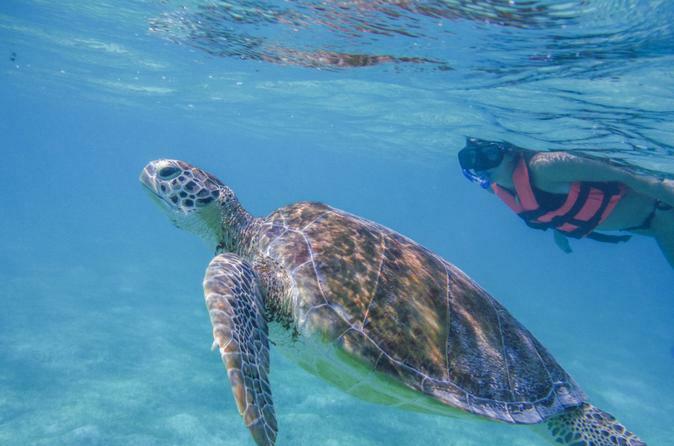 Enjoy a full day of snorkeling fun with the Turtle Snorkeling Adventure from Cancun. 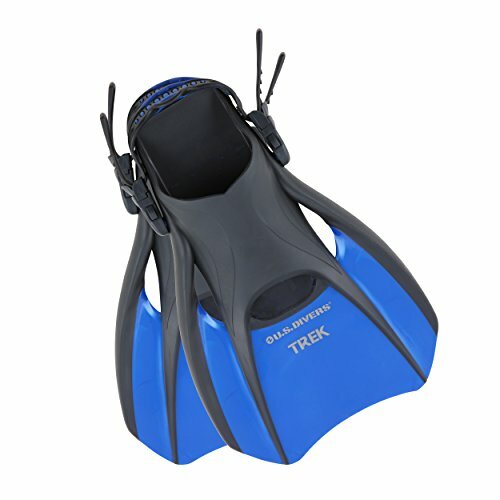 This snorkeling adventure is meant to be fun for the whole family and is great for snorkelers of every skill level. Get picked up from your Riviera Maya hotel and head straight for the marina where you will meet your professional guide and head out to the water. Your first stop is an underground cenote where you can see wonderful natural limestone formations. These complex rock formations are protected so their beauty can be enjoyed for many years to come. Once you have enjoyed this area, you will head off to the warm waters just off Akumal Beach. This area is home to four of eight of the world’s known sea turtle species. Your guide will teach you about these sea turtles and their very delicate ecosystem. Snorkel these waters, swim with the turtles and the colorful fish as you take in the sights of the beautiful coral as well. Once you’ve taken in these stunning sights, head back to your Riviera Maya hotel and share your experiences with those who have taken in the wondrous marvels with you or those back at the hotel. Encounters with wildlife have never been so up close and personal. Free snacks during your adventure are included, and so are the pick up and drop off at the hotel. In just a few hours of snorkeling time, you will enjoy getting up close and personal with marine wildlife in two locations of the Puerto Morelos Reef National Park. Your day starts by being picked up from your hotel and being shuttled 35 minutes to Puerto Morelos. There, you meet your professional and friendly snorkeling guides. They will give you instructions for the day as well as fit you for your gear that is included in your snorkeling package. Once you have all the safety information for the day and everyone is ready to head out, you will load onto the boat and go to your first destination. The first snorkeling location is actually the deeper of the two and you will get to see colorful coral and a lot of marine life. The crystal clear waters of the Caribbean allow you to see far out into the deep waters of the Mexican Caribbean. The second location is much more shallow and is home to much different marine life. The colors are more vibrant due to the fact that the sun is able to reach the coral and the tropical fish here. Once you have come in from a half-day of snorkeling, you will be taken to the “La Panza es Primero” Mexican restaurant in Puerto Morelos. This restaurant, which is one of a group of 13 altogether, specializes in Tex-Mex style cooking and strives to make their customers feel at home with homemade dishes. 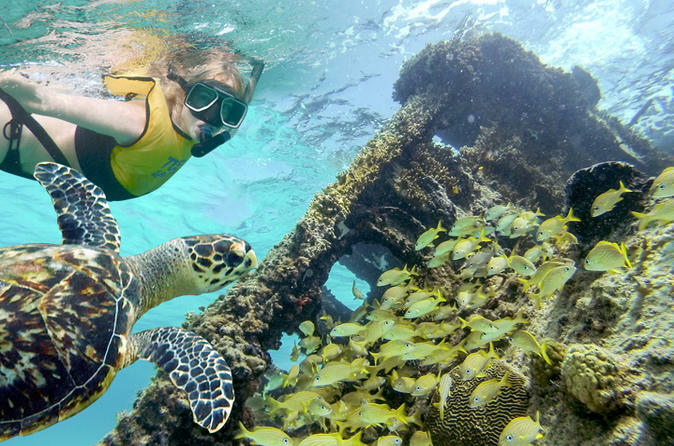 With close encounters with marine life and friendly and professional guides to allow even the novice snorkelers feel at ease in the water, you can enjoy all the sights that an underwater adventure at the Puerto Morelos Reef National Park has to offer. 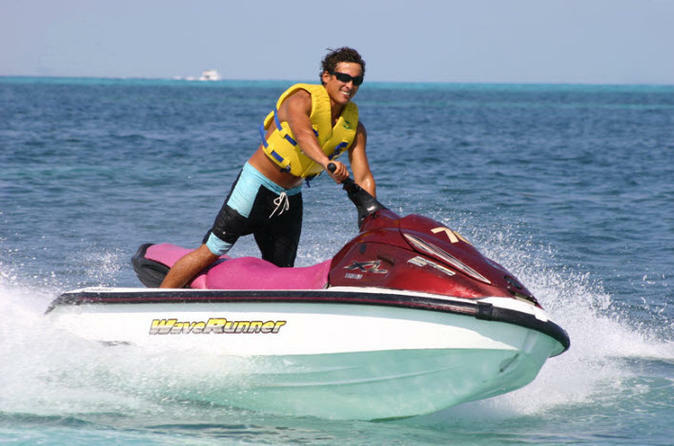 Instead of taking a boat with a group of likeminded tourists to get to your snorkeling destination, how about taking a waverunner out into the Mexican Caribbean to get there? Either take a 1-person waverunner or go with a friend on a 2-person one and enjoy the ride. You will take your waverunner across the crystal blue waters of the Caribbean, across Nichupte Lagoon, through the mangrove forest as you zip across the waves to your snorkeling destination. Your destination is a breathtaking marine habitat that is part of the second largest coral reefs in existence. After enjoying your time taking in the sights while snorkeling, you get to board your waverunner and head back through the mangrove forest and head back to the marina. You can choose from several departure times depending on when you would like to leave. 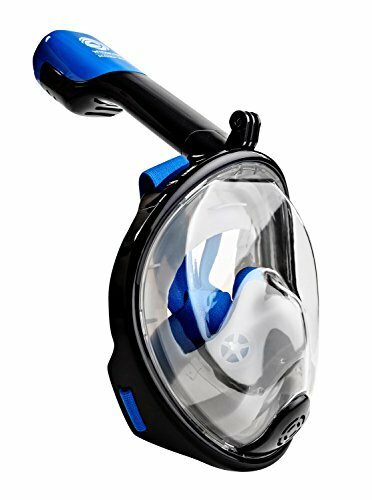 All of the equipment you need for your Cancun Waverunner and Snorkel Combination Tour will be provided as part of your package. You will need to choose whether you want a 1-person or 2-person package when you book your tour. There’s nothing like adding a little waverunner adventure to your snorkeling tour of the Mexican Caribbean. Take in the marine wildlife after enjoying the wind rushing past you as you weave in and out, and over the waves. Going to Cancun, even if you can only go for a long holiday weekend, should be something on everyone’s bucket list. There’s beaches to walk at sunset, attractions to visit, and even if you want to spend a whole day of relaxation at your all-inclusive hotel there will be plenty to do in the form of spa treatments and even a 9am tee time. Oh, and don’t forget to book your snorkeling tour! However, there are some things you should know about vacationing in Cancun before you book your trip, such as when to go, what you should be packing, and how you will be getting around the area. Let’s explore a bit of Cancun before you book your trip, shall we? If you are looking to spend less on your trip to Cancun, you could always plan to go in the off-season. However, you risk the chance of the weather becoming a problem. It’s the off-season for a reason. Mid-December to March typically has the best weather, as well as the highest costs. If you want to avoid the biggest crowds and the biggest bill, avoid Spring break season when college students flood the area. 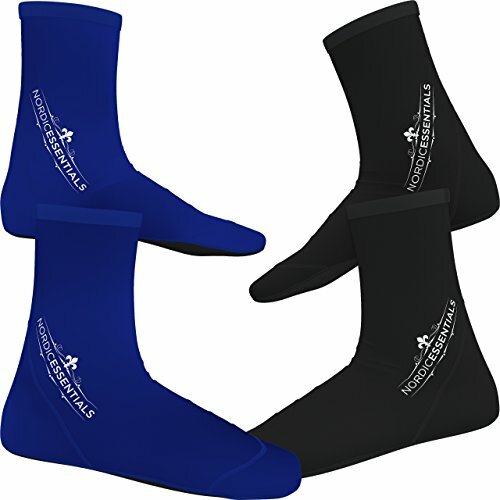 From May to December, you will run into the highest temps as well as unpredictable rains. Early December and the whole month of April are usually good compromises for both cost and weather. Public transportation is actually very good in Cancun. It’s clean. It usually runs on time as long as the weather isn’t a problem and the crowds aren’t heavy like during Spring break. 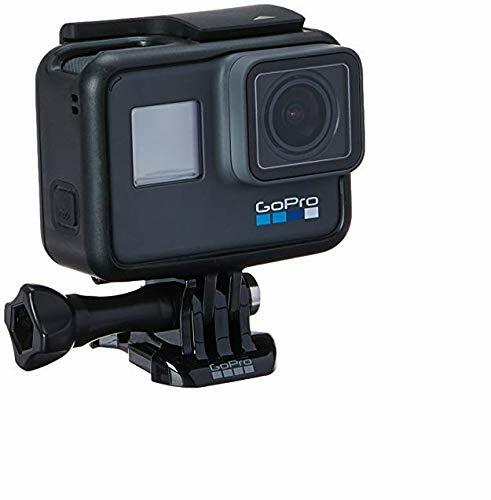 And, you will find that it will usually be able to take you to all of the local area attractions that you will want to visit without any issues. If you are looking to cut costs, this is definitely one place you can do it. Don’t spend the extra money on a rental car and worry more about packing as much fun into every day you are there as possible. Like at any beach, currents and undertows can be dangerous. If you don’t know what to watch for with the tides or how to get yourself out of a sticky situation in the water, it’s best to stay out of deeper waters. Also, you should learn what the flags by the lifeguard towers mean. If you don’t know, be sure to ask a lifeguard to teach you beach safety. Many hotels will also have brochures about how to stay safe on the beaches. If you go out at night – to restaurants, bars, or especially nightclubs – it is important to keep your wits about you. This is important while traveling to any tourist destination. Keep the flashy jewelry and cameras at the hotel room. Always have identification on you. And don’t drink so much that you can’t safely get back to your hotel. 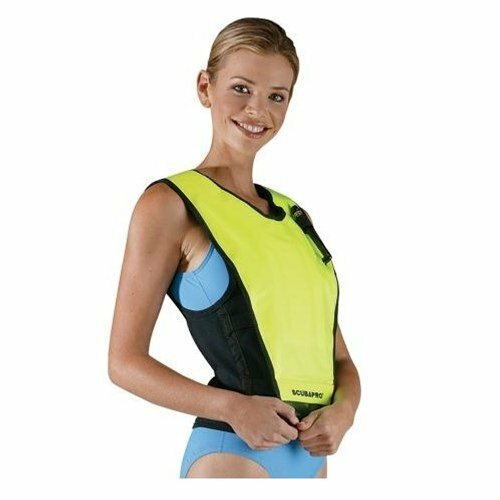 You will be getting wet quite often, whether at the beach or on your snorkeling tour, and you might end up having to bring back wet clothes. 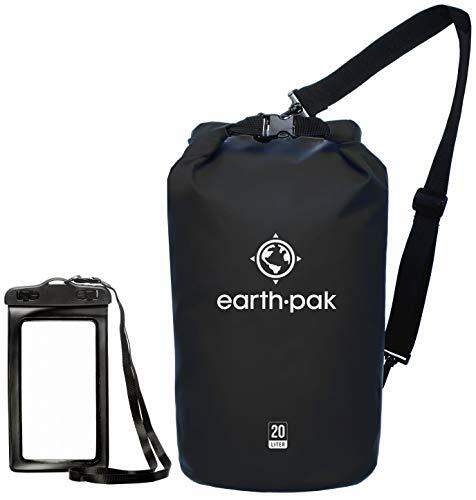 Pack a few plastic bags that can tie or zip closed so that your other clothes or your suitcase doesn’t get wet. Customs isn’t going to like seeing a suitcase that is leaking! While walking around shopping or going to the beach, you will want a tote bag, either canvas or mesh, to carry sunscreen, sandals, etc. so don’t forget to bring a beach bag. While walking around Mayan ruins or doing some souvenir shopping, you will want walking shoes and if you aren’t traveling in them, make sure to pack them along with sandals fit for the beach. Also, be sure to pack a carry-on that will make it through both the US airport as well as the Mexican airport in Cancun. You will be going both ways. If you plan on doing much shopping, you might want to pack an extra duffel for the extras that you will be purchasing to bring home with you. Plus, it’s inevitable that not everything fits back into the suitcase the way you packed it in the first time, so extra space might be handy. Now that you have the low down on vacationing in Cancun and you know which snorkeling tour you’d like to take with the family, it’s time to book your flights, arrange your snorkeling adventure and start packing! 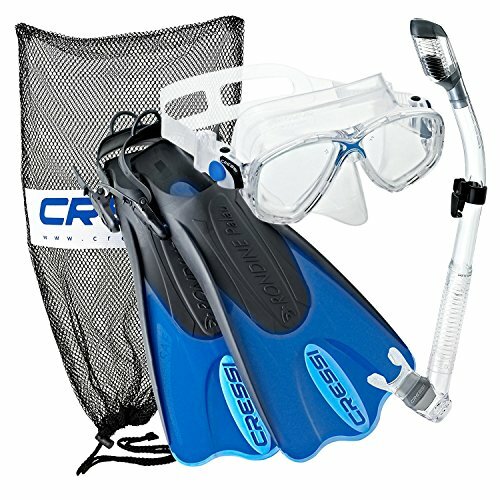 I hope this guide was helpful for finding the best Cancun snorkel tours to fit your needs. If you want to comment or recommend a tour I didn’t include, please use my contact form to get in touch. If you plan on spending any time in Cozumel, be sure to see the best Cozumel tours and our guide on How To Snorkel.